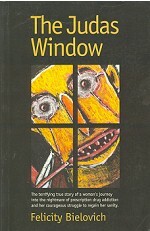 The Judas Window is a story about the devastating consequences of prescription drug abuse - a story of enormnouse significance to the thoughsands of people everywhere who have been drawn into a descending cycle of drugs, depression and ruin, and to the many more thousands who have suffered in observing that descent. The Judas Window will also speak volumes to anyone concered about the frightening power of the prescription drug industry, an industry that effectively manipulates both doctors and patients in pursuing its billion dollar gains. The Judas Window is a story about hope, dignity, and against all odds, the triumph of a human spirit.